Since launching its small business lending solutions, Liberty Capital Group has just passed a new funding milestone of $150 million. Comprised of term-loans, business cash advances and equipment leasing, the capital for this funding was sourced from direct funding, syndication and through a network of lenders across the nation. San Diego, CA, April 09, 2019 --(PR.com)-- Liberty Capital Group, the industry leader in small business funding, is proud to announce that they have passed a new milestone for fund provision since entering the market. Liberty Capital has been successfully brokering small business loans since November 2010, and today, the level of small business loans, advances and equipment financing delivered to small businesses across the country has now passed $150 million. The capital to achieve that milestone is provided by a combination of direct funding, syndication and through a network of lenders across the nation. Since its founding, Liberty Capital Groups has always believed in treating business owners with dignity. Committed to offering a fair and honest approach to the current situation business owners face daily when it comes to borrowing. They provide a service sympathetic to small business needs with a lending strategy carefully crafted to fit the small business market. Unlike traditional sources of credit, who typically don’t listen to the story behind the business, Liberty Capital recognize that it is the individual circumstance that defines any small business. Taking a consultative approach, they understand the stressful, discomforting and intimidating process seeking funding can be for small business owners. Liberty Capital instead offers a hassle-free, fast application process that seeks to assist small businesses to grow and prosper. 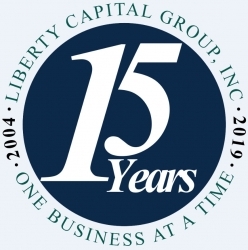 Liberty Capital Group, Inc. is a financial brokerage firm that provides capital funding solutions to small businesses. The company was founded in November 2004 by CEO Adrian Dalsey and initially focused exclusively on commercial trucks and construction equipment leasing. During the financial crisis of 2007 to 2008 lenders began to tighten up their lending standards, and many small businesses in need of working capital were soon declared too risky for a loan. Mr. Dalsey noticed this trend in the industry and has since repositioned his business to focus on brokering loans to these small businesses. As Liberty Capital group celebrates 15 years in business, this milestone in lending reflects the growth that the business has seen in recent years. To maintain client service, the company has recently taken on new staff to cope with demand. The company expects growth to continue as small businesses continue to find new opportunities in both local and global markets and require capital to exploit them. Liberty Capital Group, Inc. is headquartered in San Diego, California, USA, America’s finest city. For over a decade, Liberty Capital Group has provided Small Business Funding in California and across the nation. As a trusted Small Business Funding specialist, LCG has helped small business owners access quick, reliable, and haggle-free small business loans. As a stakeholder in the American Dream, Liberty Capital Group makes it possible for any business to compete and grow in today’s economy. Liberty Capital Group is a minority and woman-owned privately-held company. Both founders, Jules Dalsey, CEO with a long-time business partner and co-founder, Duyen Dalsey as the COO.